1. Cocoa Butter Shower Scrub. This scrub is absolutely delicious and perfect for summer. It smells like chocolate, summer and holiday. This scrub has a special blend of pure cocoa butter, coconut oil, crushed walnut shell, vitamin E, a lot of anti-oxidants and macro granules to peal off dead epidermal cells and reveal super soft skin. This product is from the Cocoa line, it has 200 ml and it costs 5.99 euro. I have a very deep love relationship with this scrub since the very first time I used it. It has a very creamy and delicate texture. It can be used 2-3 times a week with a circular motion massage that will enhance blood circulation and give a healthy glow to the skin. I think this is a fantastic product for exfoliation. Thank you Ziaja, you really spoiled me! 2. Marine Algae Spa Smoothing Eye Cream youth formula 30+. This product is an eye cream for daily skin care routine, developed for dry and normal skin, age 30+. I am somewhere between 30 and 40 (somewhere in the middle) :) and I cant live without using an eye cream. I have dry skin with a sensitive eye area and I chose this product based on my needs. This eye cream is rich in grape seed oil; the perfect ingredient to fight aging, relieve dark circles and improving the skin elasticity making the fine lines less visible and deep. 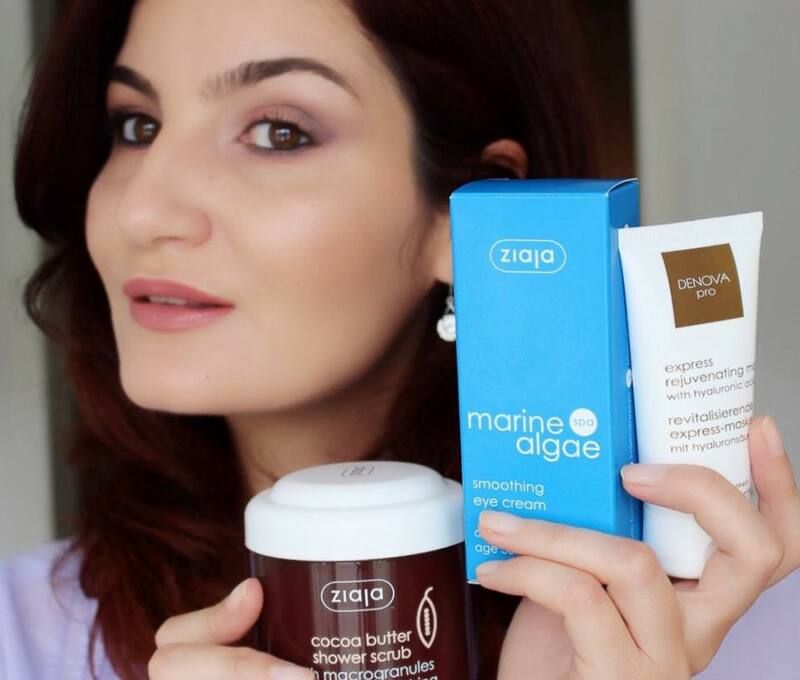 I didn't know much about marine algae in skin care but I have done a small research, the conclusion of which is: they work great for skin regeneration because they have strong healing properties. I used this eye cream only 3 times and for now I can only say that it has no fragrance, it has a hypoallergenic formula under a ophthalmologist control and I noticed it has a very special texture that absorbs fast in the skin and doesn't make my eyes watery or irritated. On the pretty blue packaging is mentioned that the cream is suitable and recommended also for contact lens wearers. I was thinking to make a more detailed review about this eye cream after I use it for a while and see what exactly are the benefits. This eye cream is from the Marine Algae spa line, it has 15 ml and it costs 4.49 euro. This is probably the best price I ever seen for an eye cream based on natural ingredients and suitable for people who wear lenses. I promise to come back with a review and update about this product. 3. Denova Pro Express Rejuvenating Mask with Hyaluronic Acid. Denova Pro is a special line from Ziaja with skin care products and treatments for a professional use in beauty salons but also in the comfort of your home. The key ingredients of this products are molecular hyaluronic acid, proteins and brightening particles. The molecular hyaluronic acid creates a natural film that strengthens the skin's protective hydrolipid barrier, actively moisturizing the skin and preventing water loss. Hyaluronic acid is actually a natural structural component of skin, and in fact is present in connective tissue throughout the human body. As we age our skin loses moisture, resulting in a loss of firmness and elasticity. Hyaluronic acid can improve your skin’s moisture content and at the same time strengthen the skin’s barrier. Hyaluronic acid also provides antioxidant defense against free-radical damage and reduces inflammation. This is a modern product that works really well as a treatment for dry/mature skin and skin damaged by sun exposure. Because of the low molecular weight, as used by Ziaja, the hyaluronic acid can penetrate beneath the skin’s surface and really helps promote radiant, younger-looking skin. Direction of use are really simple, all you have to do is to apply a thin layer of mask on cleansed skin and leave it until absorbed. The mask will form a supple and elastic film on the skin surface and it will visibly smooth the epidermis. I think this product is quite a radiance booster for mature, dry and dull skin. This product comes in a squeezing tube of 50 ml and it costs 5.99 euro. If you decide to try this product I suggest that you only use a thin layer and combine it with vitamin C products to increase the efficiency. At the bottom of the box I found also several testers. 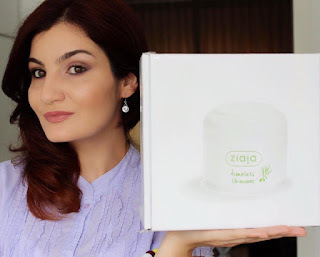 I have not tried them yet but am really excited and happy to try more Ziaja cosmetics and to discover more amazing products! I am almost finished but before I end this post I want say thank you to the Dutch team from Ziaja NL, not only for the products but also for the way they treated me as a client long before they sponsored this post and for making available in The Netherlands real skincare, based on medical and pharmaceutical expertise! Laura, they Dutch shop delivers in Belgium as well, with DHL. Cocoa butter and coconut oil are so great for dry skin,2 ingredients that make that body scrub perfect. I am sure you will love it ! I would love to try the cocoa butter body scrub. I know how good cocoa butter is for your skin and, as you say, the smell is divine! Yes indeed cocoa butter is a magic ingredient for skin. The mask sounds great. I haven't used one in a while! I think it would be helpful. That mask changed my life! Finally I found a product with hyaluronic acid that really works. I am a huge fan of chocolate and I really am interested in that scrub! I bet it smells delightful as most chocolate scented products are. It's really worth trying! Best product review post I've ever read. You convinced me 100% and next time I'm in Poland I'm going to try them out, I'm so happy they're vegan! thank you for these tips: I always look for good and hypoallergenic products because of my very dry and atopic skin. No scrub for me, but I'd definitely go with all the others. Thank you! Thank you,Sabrina ! I am really happy and it means a lot to me the fact that you find these tips useful! This scrub smells like chocolate - I can only imagine! I also cannot live without using an eye cream! ;-) Thanks for these beauty inspirations! The Cocoa Butter Shower Scrub and Denova Pro Express Rejuvenating Mask with Hyaluronic Acid seems like good products. It`s great that they have natural-based products because I truly believe in the great benefits nature can provide our skin. I just used the mask today and it is really amazing,since I use more natural based skin care products, my skin and hair are looking so much better. I think there is Ziaja USA and they probably deliver to Canada as well. Wow looks like great products! I would love to try that cocoa scrub! It sounds divine.